The Caribbean Islands have long been a popular destination for families, honeymooners, and leisure travelers. Recently however, the Dominican Republic has become all the rage for visitors. It is full of wonder, romance, and family adventure. While this is not a full beginner’s guide, it is sure to help you get started on learning about the amazing, exotic island of the Dominican Republic. Where to Stay: The Excellence El Carmen is the perfect stay for those who want to relax and unwind. Beautiful stretches of sandy beaches at your front door and poolside swim up rooms at your fingertips. This resort is the definition of contemporary luxury. As an all-inclusive, you will have access to 24-hour room service, lavish nightly entertainment, activities such as scuba lessons, and much more! As for the food, you can choose from 12 different restaurants depending on your taste pallet. Food to try: It’s hard to limit food recommendations because there are so many good dishes. But here are a few must-try foods you won’t want to miss. Sancocho – This Seven Meat Hearty Stew may include ingredients such as beef, pork, chicken, goat, ham, bacon, plantains, corns, etc. Fried Plantains – Eat this as a snack or as a part of your meal. Habichuelas con Dulce – After dinner, try this sweet bean dessert. Morir Soñando – This delightful drink is usually a mix of orange juice, sugar, and milk. La Bandera – A traditional dish full of meat, beans, rice, and salad. What to Do: The Dominican Republic is a bit “more than twice the size of New Hampshire.” But don’t let the size fool you. There are plenty of things to keep you occupied for weeks. 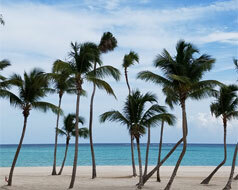 Favorite Beaches: The following is just a small portion of the many stunning beaches on the Dominican Republic. Punta Cana – This lovely beach is where many all-inclusive resorts are placed. However, with about 20 miles of beach, there is plenty of space for you to make a comfortable spot. Sosua Beach – If you love snorkeling and diving, then this is the beach for you. Playa Boca Chica – As one of the most popular beaches of the Dominican Republic, Punta Cana offers a unique mix of beach, calm waters, and market stands. It is partly surrounded by coral reefs making this beach perfect for families. This is also a close beach to hit if you are spending time in Santo Domingo. Playa Bavaro – This stunning piece of paradise is a main attraction. You won’t regret lying on the soft sand and stepping into the clear water off the shores of Playa Bavaro. Macao – A UNESCO approved beach that is the ideal spot for swimmers and beginner surfers.